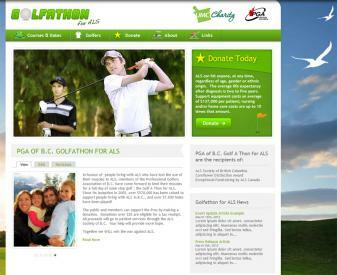 The Golfathon for ALS, sponsored and promoted by the PGA of British Columbia, in partnership with UMC Charity and the ALS Society of British Columbia, has raised over $650,000. With an inspired new look for the site we hope to help raise that bar even higher in 2012. The site and event is in honour of people living with ALS who have lost the use of their muscles to ALS. Members of the Professional Golfers Association (PGA) of British Columbia have come forward to lend their muscles for a full day of none stop golf; the Golf A Thon for ALS. Since its inception in 2005, over $570,000 has been raised to support people living with ALS in B.C., and over 57,000 holes have been played. In the spirit of golf, the new website boasts a theme-based site that reflects golf and the specific details of this event. The event takes place across different golf courses, but with each course and golfers playing for twenty-four hours - to reflect this unique event the background image of the site is an image of a golf course as the sun sets. In the spirit of giving, and to keep with the theme, Intrigue graciously created a new logo along with providing numerous donated development services. JQuery sliders that include personal stories and event successes were incorporated into the homepage. In addition to the stories, the site promotes awareness with a focus on fundraising by virtue of prominent and accessible donation buttons, a Twitter roll, and easy to manage news system. The Golfathon site, like all websites we have designed and developed in the last three years, is completely CSS 3.0 driven and includes AJAX for smooth transitions and increased visitor usability. As always, the site is SEO-friendly and includes XML site maps being pushed to all five (5) major search engines. Ready to golf for ALS?